Dal is the most usual part of Indian Meal. Bengali meal is also not out of this. But Bengali "Dal" recipe is very much different from the rest of the Indian states' Dal recipe. Bengali Dal is thinner than North or South Indian Dal. Only in Masoor Dal Bengali People use Onion & Garlic. But in other dal We do not use Onion at all. Tomatoes are also not used in our Dal. We make dal in a very easy way. Boil the Dal and just temper it. That's it. I love Lemon. Specially the Flavorful Lemon. But that is not available out of West Bengal. But one day I suddenly got Lemon leaves in a Local Chinese Market. And made my mind to make my Grandmom's Dal with Lemon leaves. Masoor dal, is an edible pulse, 30% of their calories from protein, all dals have the third-highest level of protein, contains dietary fiber, foliate, vitamin B1, and minerals. Masoor dal is nutritious, completely safe, and wholesome. In Bengali this dal is treated as a non-vegetarian and cooked with onion & garlic. I have added some Lemon Leaves to enhance the flavor of this Dal. Wash the masoor dal until the water runs clear and pressure cook them along with 2 cups of water, turmeric & some salt till they become soft and mushy. Now heat Vegetable Or Canola oil in a large pan and add Green chilies and Garlic first and fry for 2 to 3 seconds. Add chopped Onion and fry till the Onion becomes light brown. Add rest of he Turmeric and the Cooked Dal and 1 cup of water, let the dal boil for 10 minutes. After 10 minutes add the Lemon Leaves and adjust the Salt to your taste and turn off the oven. Serve this flavorful Masoor Dal with Steamed Rice and Fried Potato Or Eggplant. 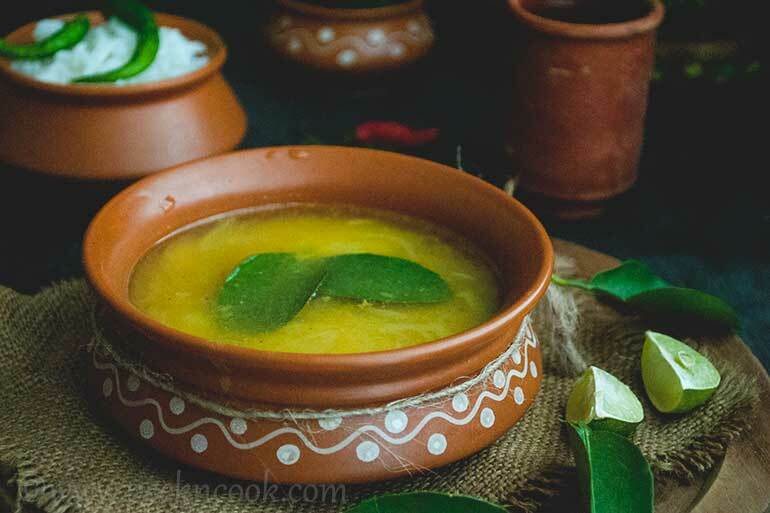 If Lemon Leaves are not available in the market , then after the 10 minutes of boiling the Dal just turn off the oven and Serve. If you do not like the flavor of lemon, do not use Lemon leaves.